Environmental activist David Suzuki is comparing Canada’s oil sands industry to slavery just as Prime Minister Justin Trudeau and the country’s premiers discuss a national climate change plan ahead of the upcoming Paris climate conference. Saskatchewan Premier Brad Wall said Monday, ahead of the first ministers meeting, that Canada needs to consider the economy when talking about reducing greenhouse gas emissions. “Whatever it is we agree to going into Paris, whatever we agree to as a country, we need to make sure we understand what impact that’s going to have on jobs. What additional impact will that have on the energy sector, which is already suffering massive layoffs in our country?” Wall said. Suzuki dismissed Wall’s comments as the same arguments used by those who benefited from owning slaves. “It sounds very much to me like southern states argued in the 19th century, that to eliminate slavery would destroy their economy,” Suzuki said in an interview Monday on SiriusXM’s Everything is Political with Evan Solomon. Suzuki says 19th-century slave owners prioritized the economy over the goal of ending slavery like Wall is putting the economy and jobs ahead of reducing greenhouse gas emissions. “Who would say today that the economy should have come before slavery?” Suzuki said. But when Solomon raised the point that people who work in the oil fields might take issue with being compared to those who worked in the slave trade, Suzuki doubled down on his position. Suzuki said slavery and climate change are not economic issues, but moral issues. “I’m with the Pope, and as you know, I’m an atheist, but I’m willing to kiss the Pope on his feet, on his hands or anywhere else he wants me to kiss him,” Suzuki told Solomon about the Pope’s position on climate change. Pope Francis wrote the encyclical “On Care for our Common Home” in May this year. He brought a strong message of the moral imperative to act on climate change to the White House and U.S. President Barack Obama on his recent visit there. In an emailed statement to Everything is Political following the show, Suzuki clarified that he was not saying anyone working in fossil fuels was like someone who was a slave owner. Suzuki said he is supportive of Alberta Premier Rachel Notley’s new climate action plan. Suzuki also said his relationship with Prime Minister Justin Trudeau is back on track after a rather testy exchange between the two back in June. 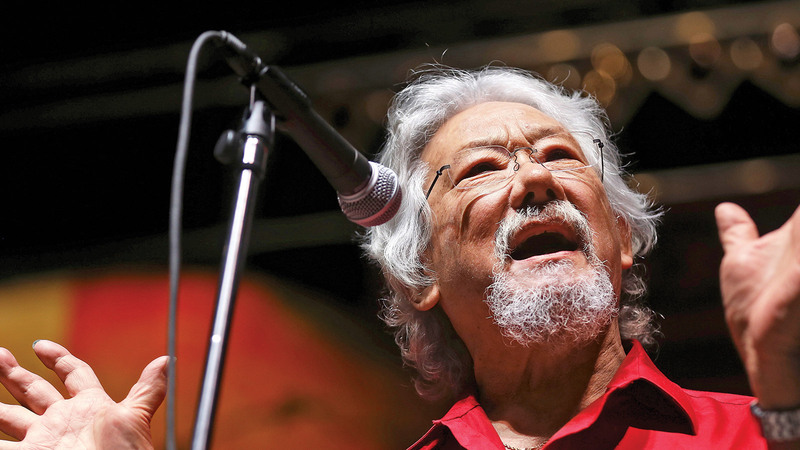 Suzuki told Everything is Political he called Trudeau a “twerp” after Trudeau dismissed Suzuki’s views on the Liberal climate change policy as “sanctimonious crap” before the election. “If you ask me what I called Harper, you would realize twerp is a term of endearment,” Suzuki told Solomon Monday. Suzuki said Trudeau has called him since the election and has not held the exchange against him. “We go a long way back,” Suzuki said of his relationship with Trudeau. In contrast, Suzuki said he has only spoken to former prime minister Stephen Harper once, when Harper was asked about climate change while doing a television interview on Parliament Hill. Suzuki said Harper responded to the question by saying the government couldn’t do anything to combat climate change because it would destroy the economy. “And when he came off I said you don’t know what the eff you’re talking about,” Suzuki said. “He’s never had another exchange with me since”.